On Friday, February 8, 2019, the Embassy of the Republic of Serbia in The Hague opened its doors for the traditional gathering of colleagues in charge of the work of international organizations and judicial institutions in The Hague. About forty diplomats from all over the world attended the informal gathering. They have once again, with their valuable contribution and presence confirmed the significance of such events in order to respect diversity and develop a culture of dialogue, especially in multilateral forums. The event was organized in cooperation and with the significant help of representatives of several European, African, Asian and South American diplomatic missions in The Hague, to whom the Embassy, once again, expresses special appreciation. 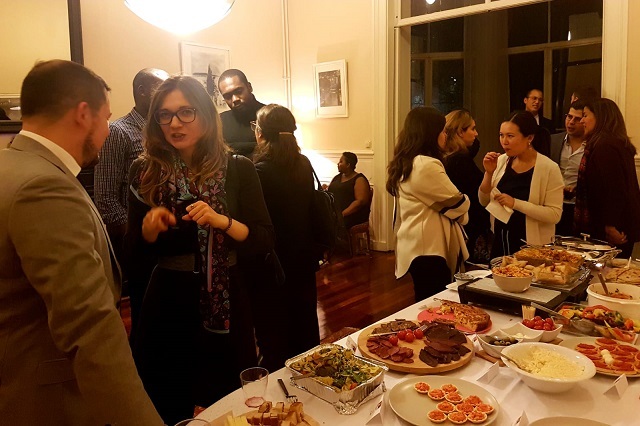 In the past two years, the Embassy organized several informal gatherings for colleagues involved in multilateral and legal issues in order to consolidate the existing and develop new professional networks.